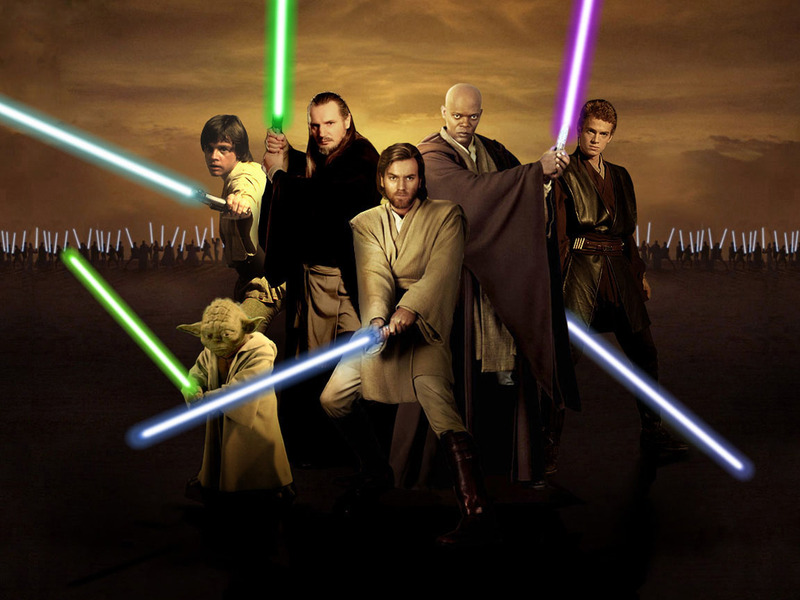 Almost everybody has heard of the Jedi Knights due to the massive success of the Star Wars franchise. But how many Muslims realise that the inspiration is actually real Sufi dervishes and the Sufi Orders? This is an article by Irfan Rydhan, an architectural designer and Star Wars fan. He lives in San Jose, California. Some of what they write about the Sufis are correct. Much of it is pretension. But overall, an interesting concept. I have corrected errors in the sirah and some of the Sufi terms used. I have also added some things that were missed in the original article about taswawwuf and the Sufis. The original article may be found here: Star Wars: An Islamic Perspective, 17th June, 2005. As most Star Wars fans know, director George Lucas took spiritual elements, which are common in most major world religions to create his epic saga of good versus evil. As a Muslim, I always thought of the Jedi as what a true follower of Islam should be like. Never mind the fact Jedi masters with their North African style cloaks and scruffy beards look like a Sufi shaykh, but they way they are taught to respect a greater power, fight for the defense of the innocent and honour a code of morals and ethics in order to bring about peace and justice to their society, is basically what Islam teaches all Muslims to strive for. So what really is the connection between these similar Islamic principles and the fictional Jedi Order of the Star Wars saga? I decided to look into this question more deeply. What I came across from my research off the internet and talking to other Muslim Star Wars fans was not only surprising, but also a bit scary. For example it was reported in a National Australian magazine that more than 70,000 Australians identified their religion as Jedi, Jedi-Knight, or Jedi-related in the country’s 2001 national census! Do these people not realise that the Jedi are fictional? There may be some truth in fiction, but instead of looking for the truth, people get caught up with the fiction. In this paper I hope to reveal where some of the truth of the Jedi and Star Wars comes from: Islam. Back when ‘Episode I: The Phantom Menace’ first came out, ‘The Muslim Magazine’ had some interesting pieces on the connections between Islam and the content of the Star Wars films. One was an interview with Dhul-Nun Owen who talks about how George Lucas had contacted members of the Habibiyyah Sufi Order in Berkeley, California in order to do research for Star Wars. There was also a piece by Mahmoud Shelton about how Sufi ideas of spiritual chivalry, futuwwat have parallels in the Jedi teachings. Surfing the internet, I came across an interesting article entitled ‘Eternal Jihad: The Way of the Mystic-Warrior’ from a Sufi website: “We are at the core a Movement of Jaddi; masters of Futuwwat. We encourage adherents to train both physically and spiritually, for their own personal edification and to enhance their knowledge and abilities in the struggle. The Real does not lie alone in contemplation, prayer and meditation; nor does it lie alone in action and revolution. Both of these are notions of ‘one or the other’ and Allah (s.w.t.) is not ‘one or the other.’ ‘Allah’ literally means ‘the Oneness which Manifests from Nothing.’ As we have stressed before, this ‘Nothing’ is not the lack of all, but rather, it is nothing in the sense of Totality of Being, which is symbolised by the numeral zero. This number itself originated with Sufis. Allah (s.w.t.) is neither the positive alone, nor the negative. Allah (s.w.t.) is the perfect balance between the two. The direct center of two polarities is always zero, Pure Nothing, from which the Totality, the tawhid, Unity, the Oneness of all becomes Manifest. For it is out of zero that all subsequent positive and negative numbers reel. That is Allah (s.w.t. ).” This is the basics of the Doctrine of Tawhid but it is not well-explained. Notice the Arabic term ‘al-Jaddi,’ master of the mystic-warrior way, along with another Islamic term not mentioned, ‘Palawan,’ similar to Lucas’ ‘Padwan’ for Jedi apprentice which were actual titles used by Muslim Knights. It is important to note that the Muslim rules of warfare are based on Abu Bakr asw-Swiddiq’s (r.a.) rules when he was caliph. This in turn was based on the Qur’an and the teachings of the Prophet (s.a.w.). It included things like not killing prisoners, women, children, non-combatants, religious figures and no wanton slaughter of animals and destruction of crops. This was the basis of futuwwat and in turn became the basis of the European code of chivalry when the Crusaders encountered them and adopted their mannerisms. ‘The Force’ is the common thread between all six movies and is defined as an energy field, which binds all living things together, for example, Allah (s.w.t. ), God, a Supreme Being or Power that most religion’s adherents worship, follow and/or yearn to become a part of. According to Star Wars mythology, the Jedi ‘are a noble order of protectors unified by their belief and observance of the Force.’ The Jedi study and train under the apprentice-master relationship similar to how many religious students study under a priest or religious scholar until they have learned enough to teach and train the next generation of students. From a Muslim perspective, the similarities between the Jedi and the Islamic traditions of instruction are strikingly similar. For example a Muslim scholar usually trains under a shaykh for a number of years before they are given the right or permission, ‘ijazah’ in Arabic, to teach others about Islam. In Sufism, shuyukh, singular: shaykh; have salasil, singular: silsilah; that list the chain of teachers going back to the Prophet Muhammad (s.a.w.). A silsilah indicates a shaykh’s lineage of mystical learning from which he draws his spiritual authority. Similarly, in the Jedi tradition of Star Wars, each padwan, apprentice, is taught the same tradition and skills their Jedi masters were taught by their previous masters. Star Wars fans know the lineage of Jedi instruction starting from Yoda to Count Dooku to Qui-Gon Jinn to Obi Wan Kenobi to Anakin Skywalker. In the first Star Wars movie, ‘Episode IV: A New Hope,’ Luke Skywalker, like his father, Anakin, live in the desert. The desert planet of ‘Tatooine’ was actually filmed near the real desert town of Tataouine in Tunisia. From among this remote desert area with no roots of a civilised urban society, a ‘Chosen One,’ like a Prophet or the Mahdi (a.s.), arises who brings a hope of peace and justice to their society. Anakin is the ‘chosen one’ in the latest Star Wars films, and Luke can be considered the ‘chosen one’ from the original Star Wars trilogy. Similarly, the Prophet (s.a.w.) of Islam lived in the desert where there was no true rule of law or justice and people followed the tribal system of blood vengeance. Prophet Muhammad (s.a.w.) brought Islam to the Arabs, which completely changed their way of thinking and the way they lived their lives. Instead of living for the present and for themselves, as Muslims they live for the hereafter and are taught to take care of the poor, orphans, those less fortunate than themselves and to fight for social justice and well being for the whole community. In the same vein, the Mahdi (a.s.), literally, the Chosen One will come out of the desert at the end of times and fight the forces of the anti-Christ, ad-Dajjal. In this case, he is personified by Emperor Palpatine. And ad-Dajjal will have a huge army whilst the Mahdi (a.s.), being from the desert will have a small force of believers. After a great conflict, he will unite the believers and bring balance to the world, just as the Chosen One will bring balance to the Force. Thus the Jedi too is taught to be selfless and not selfish like the ‘Sith,’ an ancient order of Force-practitioners devoted to the dark side and determined to destroy the Jedi. Just as Yoda taught young padwans not to give into fear and be tempted by the ‘Dark Side,’ similar to the temptations of the devil or Shaythan in Arabic, Muslims are taught not to be attached to the dunya, life in this world nor to fall prey to the diseases of the heart: jealousy, envy, fear, hatred, as they lead to evil and sin. In this, Emperor Palpatine is not just Shaythan; he is also ad-Dajjal. Just like the eschatology, he will rise through the ranks of a global or universal system and corrupt it from within. He will take charge of it and launch a crusade against the believers, in this case, the Jedi. There is an interesting connection between the Jedi master, Yoda, a short, green-skinned creature first seen in ‘Episode V: The Empire Strikes Back,’ and Islamic traditions. al-Khidhr (a.s.) means ‘the Green One’ in Arabic. Qur’anic commentators say that al-Khidhr (a.s.) is one of the prophets; others refer to him simply as an angel who functions as a guide to those who seek Allah (s.w.t.). And there are yet others who argue for his being a perfect wali, meaning the one whom Allah (s.w.t.) has Taken as a friend. So in other words, Yoda, which means ‘Wise One’ in Hebrew, is like an angel or spiritual mentor who guides the young Jedi in the ways of the force and to be strong enough to resist the temptations and evil inclinations of the Sith and other Dark Forces. In ‘Episode VI: Return of the Jedi,’ the Emperor tries to influence Luke Skywalker to give into his feelings of anger and hatred. As we all know, Luke’s father, Anakin, did fall prey to the Emperor’s whispers and joined the Dark Side. Because the al-Jaddi, as Muslim warriors, are taught that one’s intentions in battle must be pure and that it is wrong to kill out of anger, even when is outwardly justified. ‘Ali ibn Abi Thalib (k.w. ), the son-in-law of the Prophet Muhammad (s.a.w. ), was faced with this situation at the Battle of the Ditch, the noble ‘Ali (k.w.) had knocked an enemy champion of the Confederates, ‘Amr ibn Wudd, to the ground and was raising his sword to kill him, when the unbeliever spat in his face. ‘Ali (k.w.) at once stood still and refrained from killing his enemy. ‘Amr was humiliated. As ‘Ali (k.w.) walked away, ‘Amr attacked him from behind. ‘Ali (k.w.) spun around and slew him. When he was asked later, why he spared ‘Amr the first time, ‘Ali (k.w.) answered that he had fought for the sake of Allah (s.w.t.). If he killed ‘Amr when he spat at ‘Ali (k.w. ), he feared that he would have killed ‘Amr in anger. 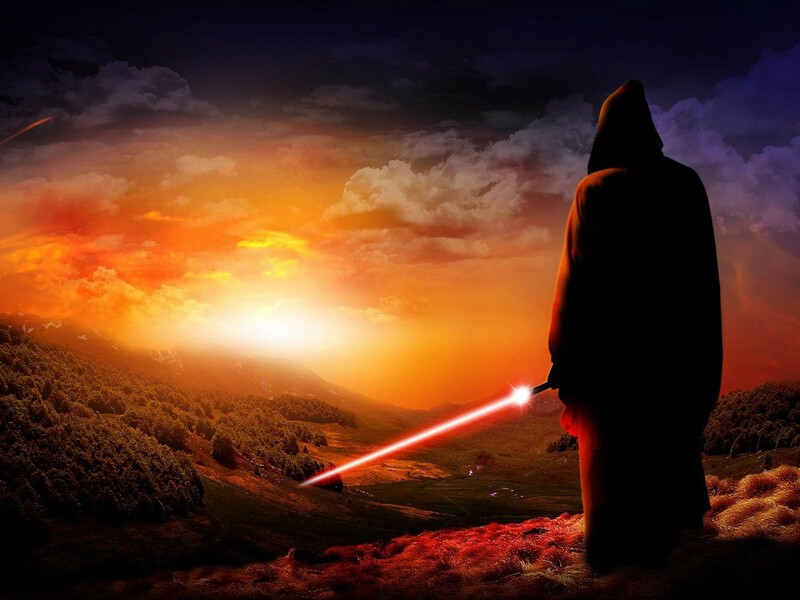 The Jedi could be considered ‘Holy Warriors’ or ‘mujahidin’ in Arabic, as they fight for truth, justice and peace. They meditate, dzikr, as much as they can, to become one with the force, even in the midst of battle. Just as in ‘Episode I: The Phantom Menace,’ the Jedi master, Qui-Gon Jinn begins to meditate in the middle of his battle with Darth Maul, while he waits for a force field to go down. The term ‘jinn’ in Islam refers to one of the forces of the unseen. Muslim history is filled with stories of Muslim warriors who also stop in the heat of battle to give their prayers to Allah (s.w.t.). Husayn (r.a.) the grandson of the Prophet Muhammad (s.a.w.) stopped to do his ‘asr at Karbala. There is even an account of a swahabah, who completed his swalah while he had an arrow stuck in his leg or foot. The lack of fear for death exhibited by Jedi Knights, Obi Wan Kenobi, Yoda, Qui-Gon Jinn, Luke Skywalker - particularly in ‘Episode VI: Return of the Jedi’ - resembles the Muslim warrior’s creed that states that the Muslim loves death more than the unbeliever loves life. There is another saying in Islam, which is “Life in this world is Paradise for the disbeliever and a prison for the believer.” Some reasoning behind this saying is that if one puts all their faith in this world, dunya, then it is very easy to fall off the straight path and be tempted by Satan, or fall prey to the ‘Dark Side’. This is shown very clearly in ‘Episode III: Revenge of the Sith,’ which is all about the Chosen One, Anakin, and his fall to the Dark Side. Lucas, himself stated in an interview that the he chose the final battle between Anakin and Obi-Wan to be on a planet with flowing molten lava and fire, which represents the fires of Hell. The ultimate showdown between good and evil. Anakin falls victim to the dark side because he loves power and the dunya, as he wanted to have the power to live forever and save his loved ones from death. He has excessive anger and arrogance, as he felt he was the most powerful Jedi and no other Jedi was better or stronger than him, and distrust for those who are his righteous guides. He felt Obi-Wan was jealous of him and thought the Jedi Council was against him, which lead him to follow other sinister forces for guidance. Lastly he had hatred in his heart. He admitted hating the sand people. Everything that Islam teaches the Muslim to avoid. The sand people or the Tusken Raiders could be considered a metaphor of the Arabs and other people of the Middle East, since they live similarly to nomadic Arabs in the desert. In ‘Episode II: Attack of the Clones,’ the Tusken Raiders kidnap and torture Anakin’s mother, Shimi, which eventually leads to her death. Anakin then proceeds to kill all the sand people in vengeance, and as he told Padme, that he killed all of them [sand people], including the women and children. But this did not relieve him of his anger and hatred. This was not the only example of Lucas getting political, since after Episode III debuted at the Cannes Film Festival, many Europeans were saying that Anakin represents Bush and his Neocon cohorts currently in power. One could not help but notice the very overt examples in the last and final installment of the Star Wars series. Of course, the most obvious example was when Anakin tells Obi-Wan before their final duel, “Either you’re with me, or against me”, which is basically straight out of Bush’s mouth when he said “Either you’re with us [America], or you’re with the terrorists” immediately after the attacks of September 11th. One of the most popular aspects of the Star Wars films are the exciting light-saber duels and swordsmanship. Lucas is an admitted fan of old Samurai films and martial arts style fighting, which of course originates from the East. As a former student of Eskrima Serrada, Stick and Blade fighting developed by Muslims of the Philippines, myself, I see a lot of similarities in the fast-moving and short-range fighting I studied for about a year and a half, and the invented art of the Jedi masters. When Anakin fights Count Dooku at the beginning of the last Star Wars film, at end of the fight, Anakin applies a disarm and cut that is a technique from Eskrima to Count Dooku’s arm. Going back into history, the technical differences between the Japanese and Chinese arts and the Muslim arts of Southeast Asia regions of Indonesia, Philippines, and Malaysia: The Muslim arts of Pencak Silat and Eskrima are based on paying attention to the limb of the attacker and not an immediate strike to the attacker’s head or torso. Ray Park, who plays Darth Maul in ‘Episode I: The Phantom Menace,’ studied kung fu and wushu and frequently traveled to Malaysia to refine and develop his skills. There are still Chinese martial arts schools indigenous to the Muslims of China until today. Their techniques of meditation are very close to what the Jedi have shown. The spiritual basis of the Muslim arts of Southeast Asia is very immense. This is the local Sufi expression of Islam, through martial arts practice, rather than through poetry or music as otherwise done in India and Turkey. Traditional Indonesian and Malay folklore attribute initial design of these arts to Muslim saints in the region of Indonesia, Malaysia and the Philippines in the 7th Century. The silat system is attributed to the Wali Song’o. Here another example of the Sufi and Jedi connection. As Jedis study the force and train in the Jedi Arts under the apprentice-master relationship, so do the Sufis. These are the techniques of latha’if, muraqabah, muhasabah and rabithah. They are found in all 40 Sufi Orders. From my brief amount of research and study into the ‘Star Wars’ saga, I found many examples connecting the ideals and principles of Islam to that of the fictional Jedi Order. Some of the similarities were clearly visible, as with the relations between the Jedi master, apprentice and the Force to that of the Sufi shuyukh, students and worshipping of Allah (s.w.t. ), while others were a bit more hidden and surprising finds, such as the term ‘Jaddi’ and ‘Palawan’ for Muslim knights and the story of al-Khidhr (a.s.), the green spiritual guru which has an uncanny resemblance to the Jedi Spiritual master, Yoda, except for the height. Even though Lucas himself is not a follower of any specific religion, he has used elements of Islam as well as other world religions to convey the universal understandings of good and evil. Combining that common thread of humanity with a futuristic space-age setting and exciting martial arts swordsmanship, came a creation that has inspired many, no matter their race, religion or culture. There is something about the Star Wars saga that everyone can relate to and enjoy. And I hope that those people who are searching for a truth within the mythology of Star Wars, will look a little deeper behind the fiction and find Islam: A true way of life which emphasises peace, justice and brotherhood for all humanity. Give an example or source. That is not true. The Qur'an refers to events mentioned in the Bible. And that is why Jews and Christians are familiar with some of the stories. As a former Christian, I can safely say that the average Jew or Christian does not know much about Islam or the Prophet (s.a.w.) at all. The average Muslim does not know his religion. It is true that Islam has influenced Christianity and Judaism. But the reverse is also true. Islam is the youngest religion, hard to say that older or oldest religions follow Islam. From a Muslim point of view, Islam is the oldest religion not the youngest. It is the religion of Adam (a.s.), Noah (a.s.), Abraham (a.s.), Moses (a.s.) and Jesus (a.s.). It is a continuing truth that God is One. Very well said brother. True indeed. Wassalam! Star Wars is a virtue and a very enjoyable saga, I'm muslim and ever since I was born i've watched Star Wars, it was the first movie i ever watched and i've collected many things for Star Wars. Director George Lucas is a Jewish man, but that doesn't mean that he is against islam. Many agree that Star Wars relates to all religions and speaks good. Recently I heard Lego (toy company) is being FORCED to stop selling a 2013 lego set called "Jabba's Palace" because they are accused that it is humiliating Islam and mocking the religion with resemblance to a Mosque. First of all, it has absolutely no resemblance and its just a toy. People who are against Star Wars are ridiculous and simply illogical. The original post is on the link in the title of the original article, next to the date of the article. Please check next time.